National Refugee Day, marked this past Saturday (June 20), was a special occasion for dozens of faith- and community-based organizations in Vancouver. 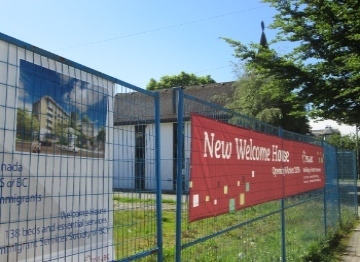 On that day, a sod-turning took place which will lead, within a few months, to the opening of a ‘one-stop’ Welcome House for immigrants and refugees on Victoria Drive, near Broadway – a five-minute walk from the Commercial Drive SkyTrain station. First CRC will be the closest neighbour to Welcome House. Ironically, First CRC used to own the property on which Welcome House will be located. It was sold off in the 1950s and, for many years, housed a number of Vancouver city and provincial social services and mental health offices. Churches, used to operating as isolated entities, are coming to realize there are well over 50 organizations available to provide assistance with the needs of refugees. Partnerships are key to meeting challenges that are bigger than one congregation can handle. In 2012, Statistics Canada reported Canada took in over 25,000 refugees. Only 7,365 of those were government assisted. Almost 6,000 were privately sponsored – mostly by churches. Almost 11,000 refugees showed up unannounced as asylum seekers. Churches like South Vancouver’s Faith Baptist and El Redentor work in partnership with New Hope Community Services to provide assistance to refugees through food banks, housing, ESL classes, employment, financial training, friendship and community support. Journey Home Community Association began as the passionate project of a home group meeting out of Willingdon Church. Led by James Grunau, they help 12 to 16 new families per year with transitional housing (apartment suites in Burnaby and New Westminster) and have supported over 40 additional families with resettlement assistance and in their move to more permanent housing. Kinbrace Society started under the wing of the Grandview Calvary Baptist Church’s Salsbury Community Society. Kinbrace operates two homes side-by-side near Venables and Commercial. Loren and Tama Balisky live on site and have overseen the work for 16 years. They have established a guide for asylum seekers which is now being adopted for use across Canada as refugees prepare for their hearings. These works attract cluster support from other churches in Dunbar, New Westminster, Richmond, Surrey, Capilano, Collingwood and Renfrew. Even the nearby Baptist Housing seniors’ homes at Shannon Oaks and Clarendon Court have provided key resources for the work. The church clusters support the work in events like the Ride for Refuge, which happens each October. Granville Chapel, on Vancouver’s west side, has intentionally chosen private sponsorship as part of their community stewardship. In Abbotsford, a group out of Northview Church has stepped up. Calvary Worship Centre, which meets in Surrey, New Westminster and Langley, has many refugees in its congregations. Dozens of ethnic churches, whose members include former refugees, are also involved in helping to free other refugees still left behind. Where does Welcome House fit? The . 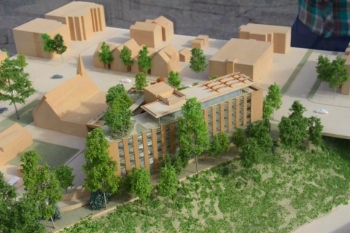 . . centre will be unique in the way it combines short-term housing with medical, banking and legal services, English-language-training and counselling, particularly for victims of torture. “This complex is going to redefine the model for how other communities around the world can best serve refugees,” said ISSofBC director Chris Friesen, whose organization supports government-assisted refugees who are pre-approved by the United Nations. … ISSofBC has [for over 40 years] been a major player in helping Canada meet its traditional commitment to accept a portion of the world’s refugees. The organization was initially formed to support more than 800 Ismaili refugees fleeing persecution in East Africa. Since then, refugees have been streaming into the group’s spartan Drake Street facility from places such as the former Yugoslavia, Somalia, Iraq, Iran and Afghanistan. When ISSofBC announced plans for Welcome House 18 months ago, it had 75 per cent of the required $24 million committed. Of that total $5 million was to come from the sale of its undersized Drake Street property. The plan was to get more from philanthropic groups, service organizations renting space in the facility and by selling corporate ‘naming rights’ to parts of the new building. The governments of Canada and BC will provide a combined investment of $1 million through the Federal-Provincial Housing initiative, under the Canada-B.C. Agreement for Investment in Affordable Housing 2011-2014 that was recently extended until 2019. The BC government will also dedicate $8.5 million in construction financing. The City of Vancouver provided the land valued at an estimated $3.4 million, $310,000 and a reduction in levies estimated at $670,000. ISSofBC provided cash equity of over $9 million. Other funders include Vancity ($1 million) and the Edith Lando Family Foundation ($200,000). Churches considering the sponsorship of a refugee can start by checking out the federal government’s Guide to the Private Sponsorship of Refugees Program. Then talk with representatives of ISSofBC or one of the ministries mentioned above. Much of the material in this article was adapted from a piece appearing in the June/July 2014 issue of The Light Magazine. 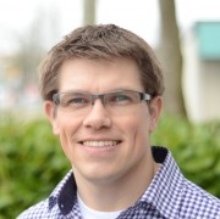 That article was written by Jack Taylor, senior minister at Faith Fellowship Baptist Church in South Vancouver and one of the key people in New Hope Community Services.